If the New York Times writes an article about homeschooling graduations becoming commonplace without any “expert” quotes on the hazards of non-traditional education, does that mean that homeschooling is now officially mainstream? Repost: I LOVE this map! Back in August, when I spoke at the 2007 HSC Conference in Sacramento, the speakers’ booth, where my books were being sold, was opposite a booth from a company called MapLink, which, naturally, was showing a huge variety of maps. I kept staring at one of them, not quite able to figure it out from a distance, and finally I went over to get a better look at what turned out to be the“World History Timeline: the rise and fall of nations,” produced by Oxford Cartographers. I’ve had it on my wall above my desk for the past three months, and I’m still fascinated by it. It shows continents on the vertical axis and time on the horizontal axis, so you can see what was happening when in the world. That big orange blob is the Roman Empire. 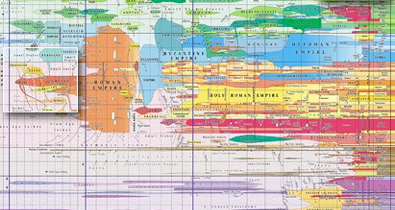 The United States is a smallish purple blob down in the lower righthand corner, which looks larger than it should compared to the Roman Empire because as you move right—toward the present—the timeline stretches out, so that more recent times take up more space. Even so, it rather puts American history in a somewhat larger perspective. I couldn’t resist—I had to make a LEGO me. The hair’s not quite right, but it’s close. You can make one, too. Migrating again . . .
I’ve kept a kind of overall archive on my mobile.me site with links to various other online projects I’ve created in the past decade—my old Blogger homeschooling and fencing blogs, my Amazon and Lulu author pages, and various odds and ends—but decided to move most of it here because I’m not sure what Apple has planned for that part of mobile.me when they implement their new iCloud. And this way, I get everything active in WordPress, which I like more and more all the time. It’s been interesting looking at a lot of the writing I did years ago and haven’t looked at since. Over the next few weeks I’ll probably repost a few of the entries from my old Viral Learning blog here, too. New posts, though, I’ll only add here if they’re specifically related to homeschooling—otherwise they’ll go up at my current main blog.